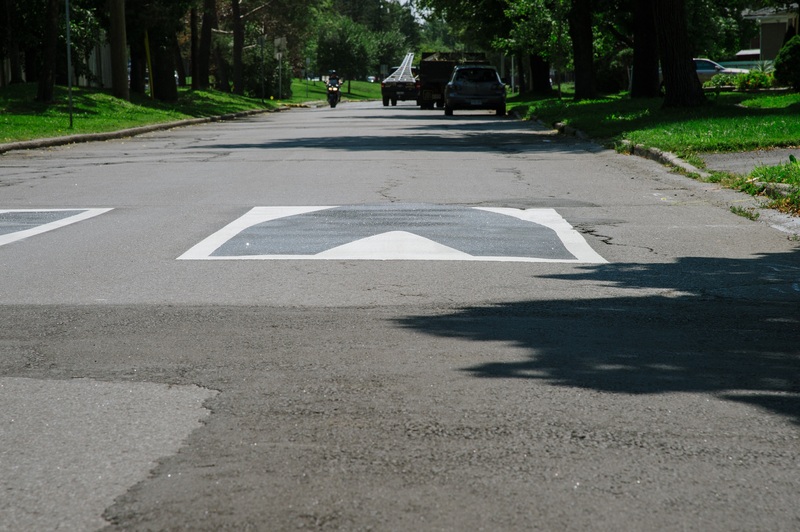 An optical illusion on the streets of Alta Vista is Ottawa’s first foray into virtual speed humps. These flat, thermoplastic road markings appear raised to drivers as they approach, giving the impression that speed humps lie ahead. The City is piloting this new form of traffic calming on Othello Avenue between Chapman Boulevard and Wingate Drive. As you drive through the neighbourhood, you’ll notice signage explaining that you’re entering a traffic-calmed neighbourhood. To prevent a parked car from obscuring the illusion, one on-street parking space has been removed until the pilot project ends in August 2019. City staff will monitor speeds to see if the humps help slow drivers down. If they do, and they’re cost effective, the City will consider adding them to its inventory of traffic calming measures. London, England piloted several optical traffic calming measures in 2014 and 2015, and found the 3D speed humps to be effective at slowing drivers. The virtual speed humps cost significantly less than traditional ones, and they also have a wider potential application than physical speed humps, which are not suitable for all roads. The two thermoplastic humps cost the City approximately $3,500. The cost for the Alta Vista humps will be paid for from the Ward Councillor’s portion of the Temporary Traffic Calming Measures Program. This location was chosen based on resident feedback anticipating more traffic in the neighbourhood as Elmvale Shopping Centre undergoes a major redevelopment.